The parish is served by two churches, the Parish Church of S. Andrew on the corner of St. Andrews Road and Queen Street, and our daughter church of S. Agnes on Jutsums Lane. S. Andrew’s church is a Grade II listed building dating from 1862 holding up to 250 people. 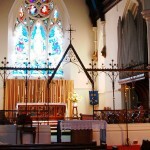 It contains many beautiful features, not least a fine set of 19th century Stations of the Cross and Chancel Screen. S. Agnes’ is a small Sanctuary area set in a Hall built in the 1920′s and holds up to 30 people alhtough, for special occasions, it can open up to allow over 100. 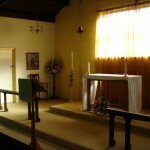 It provides an intimate space for those who want worship in a more reflective style.